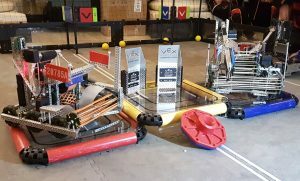 Two senior QE teams have qualified for the national finals of the VEX EDR robotics competition after convincing performances in the regional rounds. 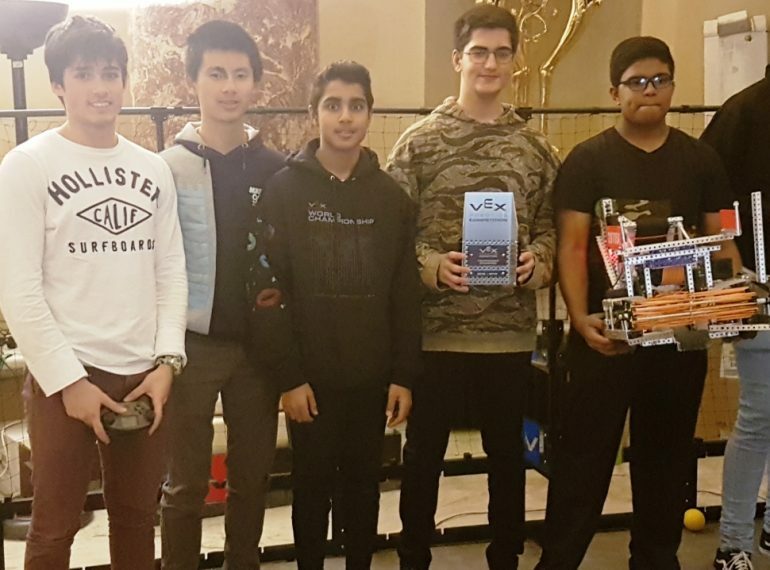 The teams are aiming to build on the School’s success last year, when QE junior boys competing in the parallel VEX IQ competition not only reached the World Championships in the USA but were crowned the UK’s first-ever world champions. 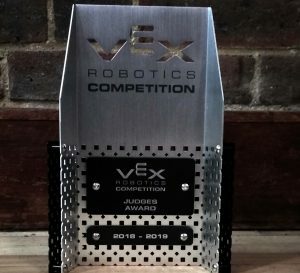 A VEX EDR team from QE also qualified for the World Championships, where they achieved the best-ever result for a UK team. 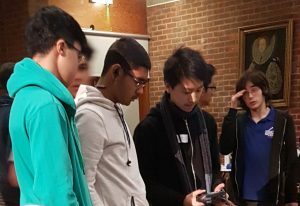 In this year’s competition, Team Hybrid (pictured top), comprising boys from Year 10 and 11, stormed through to the national finals after being crowned Teamwork Champions and losing only one of their nine matches when they competed at Stowe School in Buckinghamshire. Cobra, a new team comprising Year 12 boys competing in their first-ever VEX EDR event, have also qualified for the nationals, which take place in Telford in March. They performed strongly throughout the round held at St Olave’s Grammar School in Orpington, where they finished third in the Skills Challenge. And in the next round, at The Henrietta Barnett School, they successfully reached both the knockout stage and the final, where they lost by a mere three points. A third QE team, Apex, all from Year 10, still holds hope of qualifying for the national finals in the coming weeks. 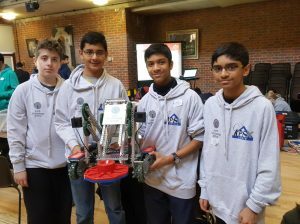 In the tournament at St Olave’s, Apex won the Judges’ Award for the design and construction of their robot and reached the semi-finals, where they lost out to the team which went on to win the round. Apex also performed strongly at HBS: like Cobra, they reached the knockout stages, where once again they were eliminated by the eventual overall winners. The VEX EDR system has elements designed to fit each other easily, thus enabling seamless integration. The competitions typically feature a series of games in which teams’ robots are given points for accomplishing tasks such as stacking items, scoring goals and parking successfully. Team s are required to collaborate, as well as compete against others. Several regional events are held, with the qualifying teams then going through to national finals and, ultimately, the World Championship, where the very best from almost 8,500 teams worldwide battle it out. There is a variety of prizes at each level, including awards for design, teamwork and all-round excellence. Team Hybrid: Dillan Shah and Alex Woodcock both of Year 10; Deshraam Ganeshamoorthy, Devin Karia, Daniel Radzik-Rahman and James Tan all of Year 11.